The Psoas Major is much simplified in our quick-fix remedies for fitness pain and improvement. Much has been written and there is still much to say. For those who are not yet familiar with the function of the psoas, lets begin by acknowledging some of the basics. Summarized, it is common knowledge that the psoas flexes the hip and knee. It shortens the joint space of the hip and effectively helps to pull the knee up. The psoas can shorten from extended seated posture, and this is a modern dilemma. This tightening can shorten stride length, it can fatigue other prime mover muscles, it can affect the health of the low back or lumbar spine. Psoas is really made up of two major components. Psoas Major and the Illiacus. It basically lines the inner hip bone, right up to the lumbar vertebrae L1-4 and the thoracic vertebrae T-12. could be the back and how it relates to the psoas. flexor – it lubricates you on the inside. 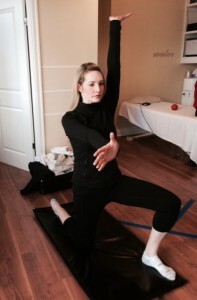 So How do we Affectively Stretch the Psoas? I see this done poorly all the time. We must engage the psoas based on its’ anatomy. Pelvic tilt. Roll the pelvis under to lengthen the attachments at the lumbar spine. Upper body engagement! Lengthen the spine by pressing to the sky through the crown of the head. No relaxed torsos. Engage the arms. They are connected to the … Thoracic spine. One arm overhead and one out in front with lots of tension. Fascia. You are releasing the fascia so engage the position with 100% tension in the position. Hold for 60-90 full seconds and breathe fully. Release your innards, stretch the psoas. Test your freedom of walking and leg feel on the stretched side before repeating on the opposite side. I have problems with my hips. I don’t understand your suggestions. Could you post a video showing the stretches? Thanks. Hi Patty, Thank you for your comment. 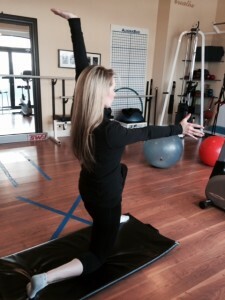 We just updated the post with some pictures of the proper stretching technique for you. We hope that helps!